One of the main challenges to hopes for peace in the Middle East today is the campaign to boycott and isolate Israel - the only true democracy in the region. This campaign, whose ultimate goal is the elimination of Israel and the violation of Jewish rights, is active primarily in the economic, cultural, and academic spheres. This weekend (Jan. 7th), anti-Israel activists are forcing the Modern Language Association (MLA), a 25,000-member academic organization, to vote on a resolution calling for a boycott of Israeli academic institutions. Similar proposals have been widely condemned and rejected by the MLA in the past. Indeed, a large group of Nobel Prize winners called the boycott against Israel "antithetical" to academic freedom and freedom of expression, and most likely a form of, "discrimination by virtue of national origin." Meanwhile, supporters of the boycott have largely responded to critics by claiming that their actions are grounded in principles like social justice, human rights, and international law. This stated commitment to progressive values should be judged against a disturbing new fact which has come to light: the US Campaign for the Academic and Cultural Boycott of Israel (USACBI) receives its funding through a hate group with a long history of promoting racism and violence. USACBI is the leading organization pushing for academic boycotts against Israel in American academic associations. Numerous members of USACBI's leadership are spearheading the campaign within the MLA, including one who was recently elected to the MLA's executive committee. In its mission statement, the organization claims to stand up for, "equality, self-determination, human rights... and true democracy," while espousing non-violence. And yet for years now, USACBI has received fiscal sponsorship from Al-Awda – a group which represents the very opposite agenda. Al-Awda is an activist organization which traffics in racism and wild conspiracy theories, and whose leaders have celebrated the murder of innocent civilians. According to the ADL, Al-Awda has voiced support for racist terrorist groups like Hamas and Hezbollah since its inception in 2000. In a series of protests sponsored by the group in 2006, Al-Awda speakers made statements such as, "we are all Hezbollah... I believe in armed struggle," and "this will not come to an end until Israel is finished, until there is no Israel". Meanwhile, the crowds at these protests chanted racist slogans like, "Palestine is our country and the Jews are our dogs!" Fast forward ten years, and little has changed. 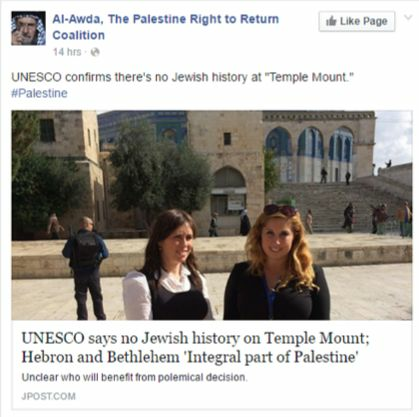 Scroll through Al-Awda's official pages and you will find them stating unequivocally that, "Israel does not have a right to exist," spreading imagery which equates Judaism with Nazism, and claiming that, "there's no Jewish history" at the Temple Mount (the Jewish people's holiest site). As world leaders mourned the passing of Shimon Peres in September, Al-Awda celebrated and promised to, "honor him with a public toilet in a Free Palestine". The group also seems to have appointed itself as the ultimate judge of who "Real Jews" are – conveniently choosing the 1% fringe who burn Israeli flags in the streets and support discriminatory boycotts against Israel. The views of individual Al-Awda leaders are deeply disturbing as well. The group's chairwoman has posted in support of Hamas on social media and spread a wild conspiracy theory about Israeli involvement in ISIS. 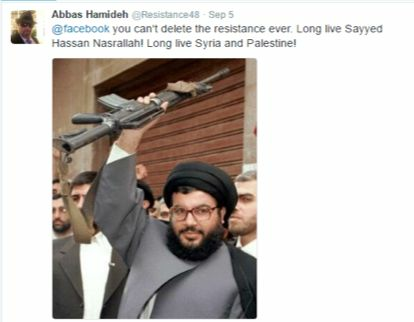 Co-founder and Vice Chair Abbas Hamideh hailed Samir Kuntar – a terrorist infamous for murdering a four year old child – as a "legendary Hezbollah martyr" and glorified Hezbollah leader Hassan Nasrallah. Al-Awda's Treasurer celebrated a wave of car ramming attacks against Israeli civilians by posting the chilling image below, along with the phrase, "by all means necessary!!" Al-Awda has been USACBI's fiscal sponsor since 2013 (details on what this means can be found here), and the two groups were linked before that as well. Multiple members of USACBI's original "Organizing Committee" were also representatives of Al-Awda, and many current USACBI leaders have spoken at Al-Awda conferences. USACBI might protest that they cannot be held responsible for Al-Awda's racism and support for violence, and it goes without saying that well-meaning supporters of academic boycotts should not be considered guilty by association. Yet USACBI itself has demonstrated that it is, at minimum, very tolerant of extremism and hate. Steven Salaita and Jasbir Puar continue to hold prominent positions in the organization, despite being repeatedly exposed for using classic anti-Semitic slurs to slander and dehumanize Israelis. As a matter of policy, USACBI boycotts all, "academic activities and projects involving Palestinians and/or other Arabs on one side and Israelis on the other," unless the Jewish Israeli side agrees in advance to effectively oppose its own right to self-determination. This is not a stance an organization that is genuinely committed to justice and peace would ever take. USACBI cannot claim to support principles like justice, equality and non-violence while gaining significant financial benefits from what can only be described as a hate group. At a time when anti-Semitism, Islamophobia, and other forms of racism increasingly threaten campus life, there is no place for political agendas that fan the flames of hatred and further divide our diverse communities. Al-Awda's deep involvement in campaigns like the one being waged against Israeli academics in the MLA is yet another reason why people of conscience should stand up for their values and reject the academic boycott. The road to peace can only be through building bridges of understanding and tolerance between peoples, not through further alienation and estrangement. It seems nothing could be more true and relevant to today's Middle East.